Next generation electronic and optoelectronic devices demand advances in semiconductor materials. UV-C optoelectronics, high performance power conversion devices and high power, high frequency RF devices are all made using (Al, In, Ga)N epitaxial layers with high Al concentrations, typically above 60%. The key to successfully producing these high performance devices is utilizing high quality AlN substrates on which these epitaxial layers are laid down. 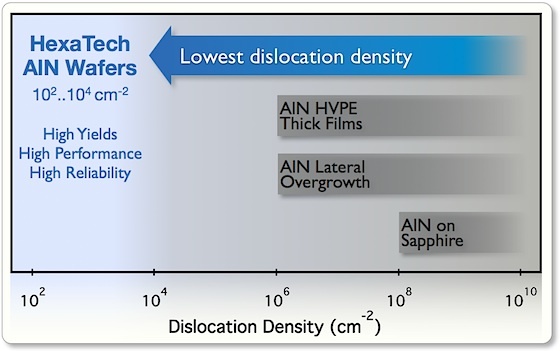 Without the use of AlN, device manufacturers are relegated to building III-nitride-based devices on sub-optimal substrates such as sapphire or silicon carbide (SiC), and therefore are forced to implement exotic and sometimes expensive fabrication techniques to compensate for the mismatch in materials, often with sub-optimal results. From a market perspective, this alternative approach has been both disappointing and predictable; devices riddled with defects that don’t meet the performance or reliability needs of the customer. By manufacturing devices directly on native AlN substrates, HexaTech’s process shows 10,000 to 1,000,000 times fewer defects than the next best technologies. HexaTech’s high quality substrates translate to devices with superior performance, reliability and production yields. HexaTech currently offers single crystalline AlN substrates in c-plane and m-plane orientation. Please contact HexaTech Sales for details on available wafer sizes, pricing and lead times.